France is quite simply the center of the culinary universe. 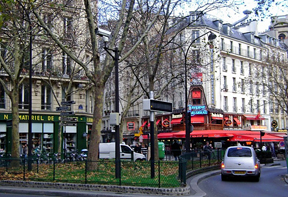 And the City of Light itself is home to world-class restaurants—Le Meurice, L’Astrance; top cooking schools—Le Cordon Bleu, Ferrandi; celebrity chefs—Alain Passard, Joel Robuchon; and some of the finest culinary supplies stores on the planet. 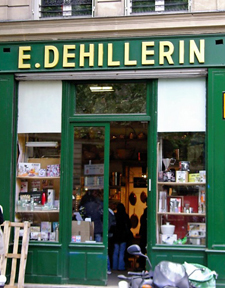 The very best of these renowned boutiques is E. Dehillerin. Founded in 1820 (yes, the shop is nearly 200 years old), E. Dehillerin is ground zero for high-end culinary equipment, from dishes and serving utensils to cookware, knives and specialty tools, and draws in customers—both pros and amateur cooks—from all over the world, including current culinary superstars Robuchon, Paul Bocuse and Michel Troisgros, as well as the legendary Julia Child, who was a regular E. Dehillerin shopper for more than 50 years. 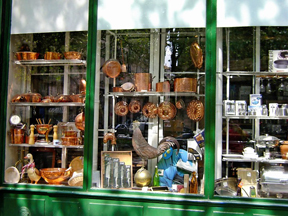 And while there are thousands of products for sale, the shop is perhaps best known for its iconic copper pots and pans. There are more than 100 professional-grade copper items to choose from—stew pans, sauce pans, sauté pans, frying pans, soup pots, braising trays, stock pots, roasting pans, fish kettles and more. And the copper items are available in several varieties, including Cuprinox extra-thick copper, Inox induction, copper lined with tin (the most popular category) and standard Cuprinox. There are also copper pastry bowls and pans, and copper tableware (like champagne buckets and fondue pots. The copper items for sale at E. Dehillerin are quite expensive, particularly for us amateur cooks used to buying our pots and pans at U.S. department stores. For example, sauce pans will run from about $85 for a tiny pan up to nearly $250; stew pots range from $200 to $750; braising pans start at about $550. There are even a handful of pots and specialty cookware priced at nearly $1,000. And for many of the pots and pans, lids cost extra. But, as all cooking enthusiasts know, copper cookware is top of the line, lasts forever and is widely considered well worth the investment. In fact, many U.S. customers who’ve blogged about the items they’ve purchased at E. Dehillerin even claim their new copper pots and pans have helped them overcome cooking issues that they’ve struggled with for years. That’s not to say that every customer at E. Dehillerin leaves with copper products. There’s a wide range of pots and pans in Inox, aluminum and cast iron in addition to the copper items, but there’s also a full range of kitchen utensils, knives, baking mats, chopping blocks, cooking thermometers, silicone molds and much, much more. 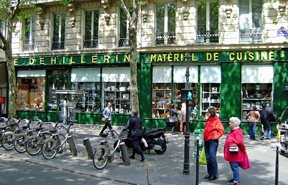 It’s quite possible to get a relatively inexpensive Parisian “souvenir” at E. Dehillerin, like a madeleine pan or escargot dish without breaking the bank. 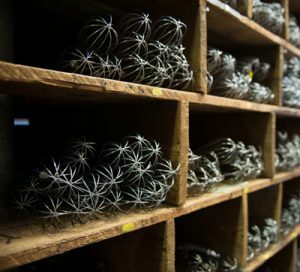 So it’s quite permissible to simply browse through the two-level shop that’s stacked floor to ceiling with every cooking implement imaginable and grab a whisk or two to buy at the ground-level cashier. But if you’re interested in more substantial purchases—particularly the copper items, which are gathered for you and brought to the sales desk—you should have a good idea of what you need before approaching a store clerk to place your order. Many of the clerks speak fluent English, so the language barrier will likely not be an issue (and, as in all Parisian shops, greet them with a hearty bonjour and ask, in French, if they speak English before you start belting out your order en Anglais). But these harried employees are trained to deal primarily with professional cooks, and as such they don’t have a lot of time (or patience) to answer a multitude of questions or provide one-on-one tours of the boutique’s products. Of course, they’ll make sure you get what you need—and they’ll even ask you a few questions to ensure that the products you’re buying are the best possible match (Will you be cooking daily with the item? Home cooking or professionally? For how many people will you be cooking? What food items do you intend to cook in the item?). I’d even recommend checking out the boutique’s website to get an idea of the products available, the types offered–such as whether you’re interested in, say, copper lined with tin as opposed to Inox induction items–and the sizes you may need. Because I was loading up on copper pots, pans, lids and bowls during one of my visits to the shop, I actually decided on the specific items I wanted before I even entered the shop. (The shopkeeper looked like he wanted to kiss me, he was so happy that I had done some advance research!) Even so, the clerk helpfully steered me toward one or two alternative products after asking me a bit about how I intended to use them. But don’t be so daunted that you miss out on a visit to this wonderful shop. You’ll never feel unwelcome or uncomfortable. And even if you don’t intend to buy anything—or just plan on purchasing something as simple as a couple of wooden stirring spoons—E. Dehillerin is still well worth the trip. This entry was posted in Culinary Supplies, Food, Les Halles, Right Bank, Shopping and tagged copper cookware, E Dehillerin by Bob Adams. Bookmark the permalink.